"The formation of the Oceanport First Aid Squad began in August, 1948, when a group of Oceanport Firemen, working at the Oceanport Firemen's Fair, heard about the availability of a used ambulance. They decided that the Borough of Oceanport, because of its rapid growth, needed a First Aid and Ambulance Service of its own, so as not to have to depend on or overtax the services of the surrounding communities. The charter members and Mayor Ken Riddle, Police Chief Charles Walling Sr., and K.P. West donated funds and solicited additional donations to procure the ambulance and the needed equipment and supplies to start this squad. 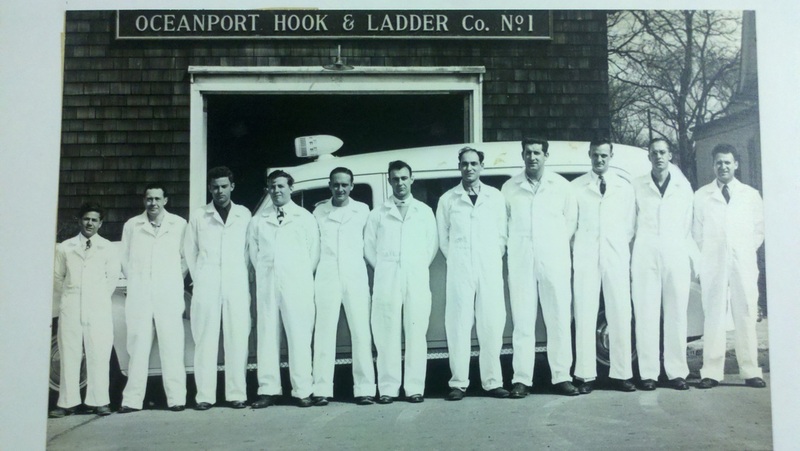 The organizational meeting was called on September 22, 1948, in the Oceanport Hook and Ladder Firehouse. The following were elected to Squad Office: President, Robert Berry; Vice-President, John Murphy; Secretary-Treasurer, Charles Walling Jr.; Captain, Thomas Robinson; First Lieutenant, George Morris; Second Lieutenant, John Welch; Chief Driver, Albert Cosentino; Trustees, James Finn, Frank Callahan and William Reilly. The following members were also present: Louis Myers, Edwin Ryan, John Hauser, William Brown and C. K. Riddle. The Squad voted affiliation with the Oceanport Fire Department and required membership in either the Oceanport Hook and Ladder Company or the Port-au-Peck Chemical Hose Company of its applicants. A Red Cross course in First Aid under the instructor Frank Palmer of West Long Branch was completed in December, 1948. In January, 1949, the ambulance was purchased and the members worked during January and February to recondition it. The incorporation of the Oceanport First Aid Squad and the official start of First Aid Services became an actuality on March 1, 1949. Squad Doctors were Dr. Peter Scoles and Dr. D. I. Diamond. Upon formation of the Squad, the ambulance was housed in the Oceanport garage, then located at the bridge on the Oceanport Avenue approach to Fort Monmouth. The garage was operated by squad member Albert Cosentino. An aid horn was installed over his auto repair shop for first aid service signals. 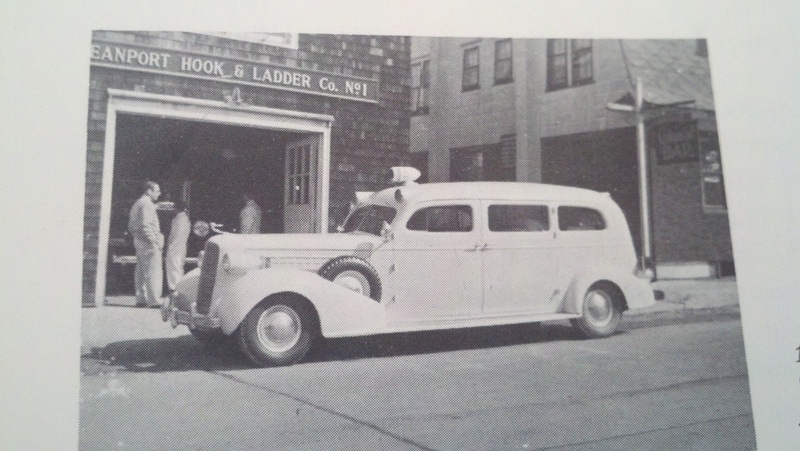 Upon completion of the new Oceanport Hook and Ladder Firehouse on Main Street in 1950, the ambulance was transferred to the new building and service calls were linked into the Borough fire call system. A new Miller-Cadillac was purchased in September, 1952, and was in service until 1960 when a new S & S Cadillac was purchased. In 1967 a used Cadillac 1950 ambulance was donated to the squad by the Monmouth Park Jockey Club. 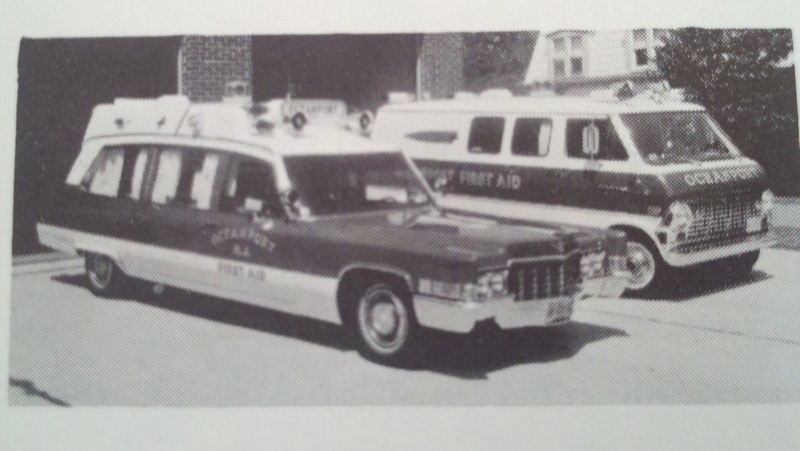 In 1969 both ambulances were replaced with a 1969 superior Cadillac and a 1969 Ford Ambulance. In the initial year of 1949, covering 9 months of operation, the Squad answered 67 first aid calls. Squad operation in the year 1968 answered a total of 266 calls. For Squad service a 24 hour schedule is maintained, members are all volunteers; the Squad is available to all in need of its first-aid services. Its funds are obtained by donations received through its Fund Drive each year. All active members are trained to aid and care for the victim of accidents or sudden illness until the services of a physician can be obtained. The Squad maintains a boat with an outboard motor and trailer to be carried to the scene of any drowning or waterway emergency. The Squad maintains modern oxygen equipment for artificial resuscitation and respiration. It loans to the homes of Oceanport resident's oxygen equipment and supplies without charge. The Squad meets once each month, alternating between the Oceanport Hook and Ladder Firehouse and the Port-au-Peck Chemical Hose Firehouse. The Squad is affiliated with the Monmouth County Association of First Aid Squads and the New Jersey State First Aid Council. Full cooperation is maintained with all First Aid Squads. In October 1968, this Squad instigated the installation of a Plectron Alert System in our Borough, thus placing a direct-signal, call-location information receiver in the homes of Squad members. This makes it possible for immediate action by our Squad members in the area of the call. Each Squad member carries an oxygen unit and a first-aid kit in his car and can give aid until our ambulance arrives. This systems allows or expansion and our Borough has the extended it by hooking up fire signals into it in order to activate the Fire Department more speedily." Robert Barry (Squad President), Frank Callahan, C. R. Walling Jr, John V. Hauser.